We believe in getting to know our students as individuals. It's Catherine's belief that proper dance technique is the key to developing better dancers. We achieve this is through smaller class sizes. It is our sincere hope that with love and support, a student will do amazing things through her training with our studio. When she was little, Catherine wanted to be a ballerina. As Catherine got older she realized she loved teaching ballet. Catherine feels her caring nature and her ability to make each girl feel special makes her a good instructor. Students come to class to have fun and work hard. The staff are able to combine their unique gifts to help girls grow and become wonderful people and beautiful dancers. For many, Catherine’s Dance Studio is another place to call 'home', a place to belong. A student wrote a paper on Catherine’s Dance Studio and said the studio was like a ‘family’ to her. Consequently, not only did Catherine make her feel special but the girls she danced with made her feel special as well. When Catherine graduated from UMKC (where she was a dance team member), she was choosing between two career options: teach in a classroom or focus on her own dance studio. Her choice was obvious. 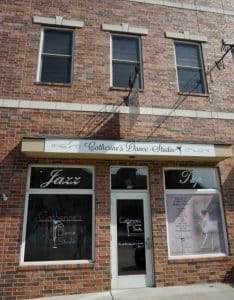 Having grown her class list to the point where she couldn’t accommodate any more students, (due to time and space constraints) Catherine opened her dance studio in downtown Parkville. Little and big girls are meant to feel like they belong, and they do. The instructors consider each student they have a blessing. Find out more about Catherine's Dance Studio. Call (816) 214-7370 or go to our registration page for a detailed class schedule.